During the winter season, when temperatures can drop below zero, many Minneapolis residents spend their weekends at the Minneapolis Convention Center, which hosts some of the best events in the city. 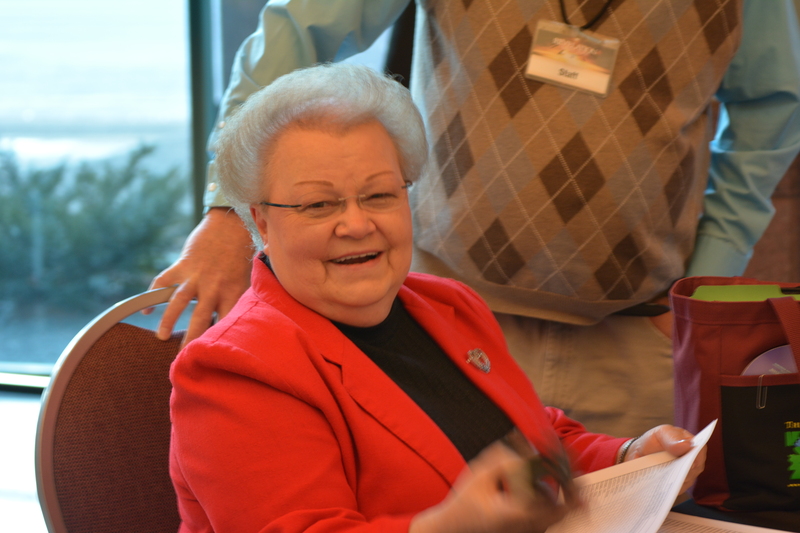 Friday, Feb. 27, was no exception, when the Revelation Speaks Peace team welcomed guests who were eager to learn what the Bible says about some of the most important and misunderstood religious topics today. 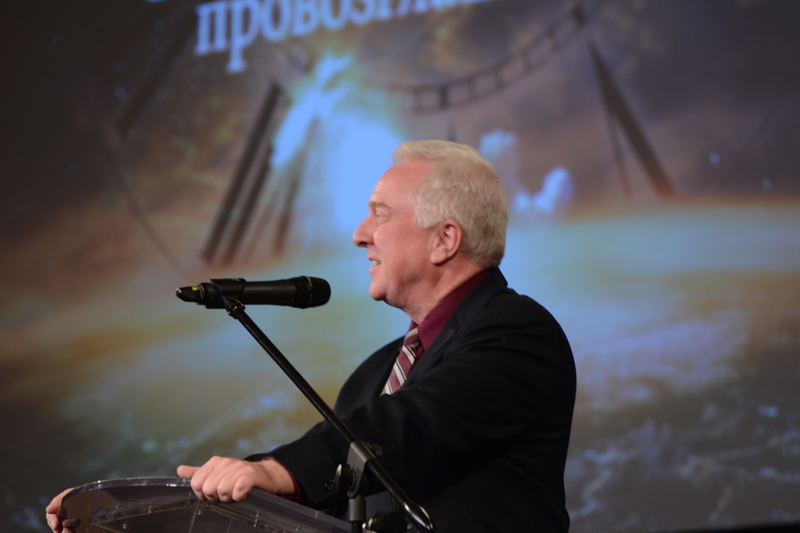 The series, which is sponsored by the Voice of Prophecy and the Minnesota Conference of Seventh-day Adventists, will continue to run nightly (except Mondays and Thursdays) through March 28. 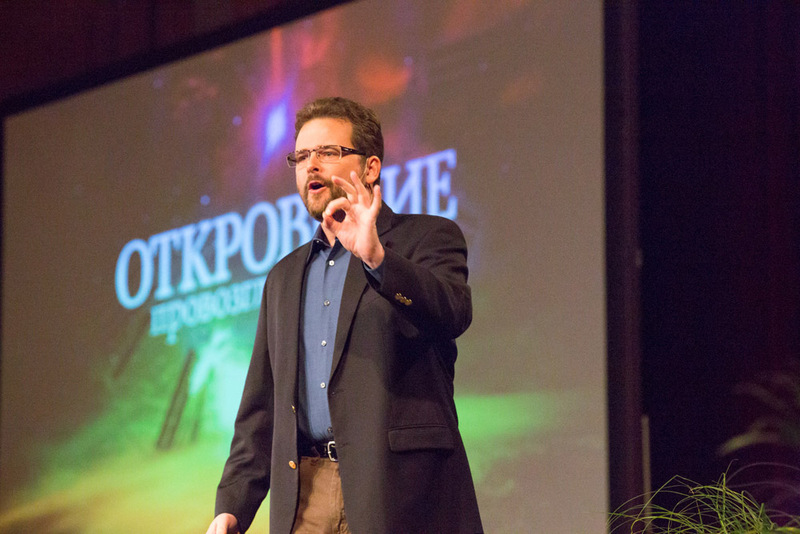 Hours before the opening meeting began, the event’s speaker, Voice of Prophecy Speaker/Director Shawn Boonstra, spoke about why he believes in evangelism. “I signed up for this because it changes lives!” he said. From the moment people started streaming down the escalator, it was obvious the Lord had been working on many hearts in the Minneapolis area. Local pastors, volunteers and Voice of Prophecy staff members registered attendees who had heard about the series on television, through a handbill, on the Internet or via a friend. 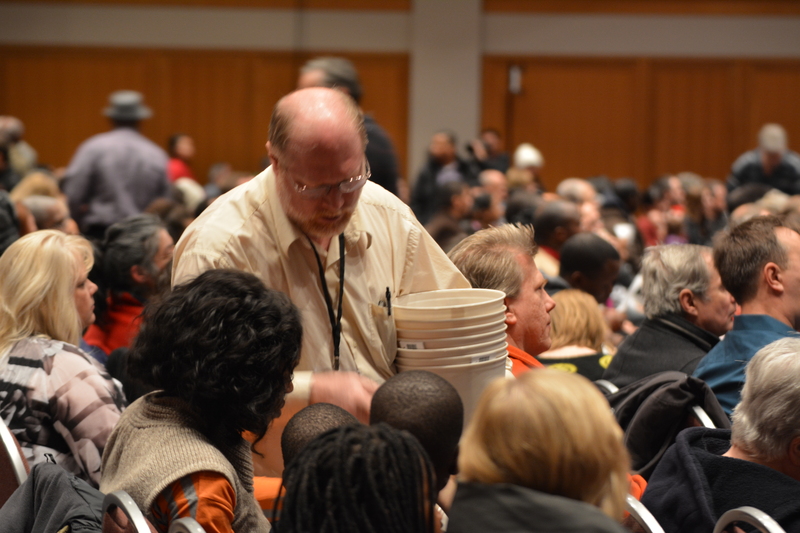 The crowd was so large that some people had to be seated in an overflow section in the back of the auditorium. 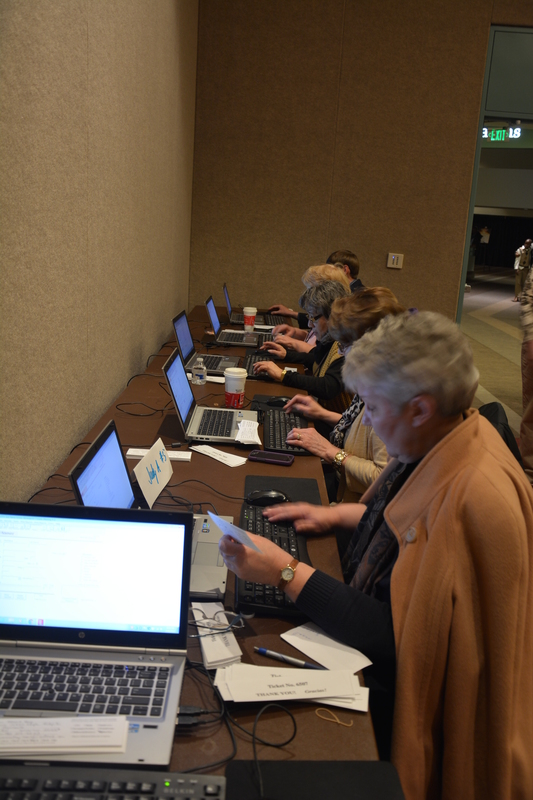 By the end of the weekend, more than 1,400 people had filled out a registration card at the event. The pastoral team will continue to follow up with every name throughout the series. During opening weekend, something that could have been a challenge turned into a blessing. In addition to Revelation Speaks Peace, the convention center was hosting a massive home and garden show. As a result, thousands of people passed by the entrance to the meetings. Friendly greeters were ready with handbills and invitations to attend—and many did. God is working through this series in other areas of Minnesota as well. A number of other churches wanted to participate, but the distance to Minneapolis was too great, so a special arrangement is enabling them to participate remotely. Churches in places such as Arlington, Bemidji, Buffalo, Detroit Lakes, Faribault, Park Rapids, Pipestone, Thief River Falls and Windom are hosting the series for people in their communities. It’s amazing to see how the Lord touched hearts during the first weekend of the series, but there is still much to be done and many critical decisions that these precious souls will be making in the coming days. Please continue to pray for this series, and if you know someone who lives in the Minneapolis area, please refer them to the event website at www.revelationspeakspeace.com, as there is still time for them to attend! I was pleased to see the first of the “Revelation Speaks Peace” meetings go so well. All of the glitches seemed to be things easily resolved before the next meeting or two. Most of the glitches were minor challenges. I was told by some of the Voice of Prophecy staff that we had over 1600 in the auditorium and about 80 in the children’s program; about 1700 total. I haven’t heard from the live-streaming sites as to attendance yet; but, I know that the technical problem which was present during Thursday’s test has been resolved so that the remote sites had sound and video on the following nights. There was only one significant security issue of which I was made aware – apparently an intoxicated person tried to climb up on stage just prior to the meeting. Jason Salyers, and the security team dealt with it in such a way so that most didn’t even know there had been a problem. That’s the way we like it! Please continue to pray that we have no major security challenges. Our interpreters seemed to be doing a great job in spite of the fact that their video monitors didn’t work at all, the first night. The resolution on the monitors was not compatible with the video signal, but that challenge was soon remedied. I saw lots of enthusiasm and heard many positive comments afterward. I spoke briefly with several guests, and listened at length to another. The church member who brought that particular person seemed to appreciate that I had granted so much time to her guest. Our data entry team was still at work at 10:30 p.m. when I left them. Thank you again to all the volunteers, to our employees, and to the VOP. We’re in this together. I am sure God will bless these efforts. I believe He already is doing so. Let us keep lifting up Jesus. Bemidji had about 35 with six being guests and one an inactive member. Faribault had nine meeting in an elder’s home with five being members. Park Rapids had 42 with 21 being non-members. Thirteen of those had never been in the church before now. Those came because of the handbills. Open Arms (in Thief River Falls) had over 50 people in attendance. There are other locations: Arlington, Buffalo, Detroit Lakes, Pipestone, and Windom. We seemed to have fewer challenges in the meeting hall on day two. Even though we started a little late, the plan at this point is to start right at 7:00 p.m. each evening. Our interpreters started with the handicap of not having video again this evening; but, thanks to Carlos Rodriguez, they each had video by the end of the program. Our live-streaming froze for about five minutes which caused most of the remote sites to switch to the DVD back-up program which was recorded back in 2005 or so. We believe we are on top of that problem now too. We will put a person on it to watch and correct the situation immediately if it goes down again. 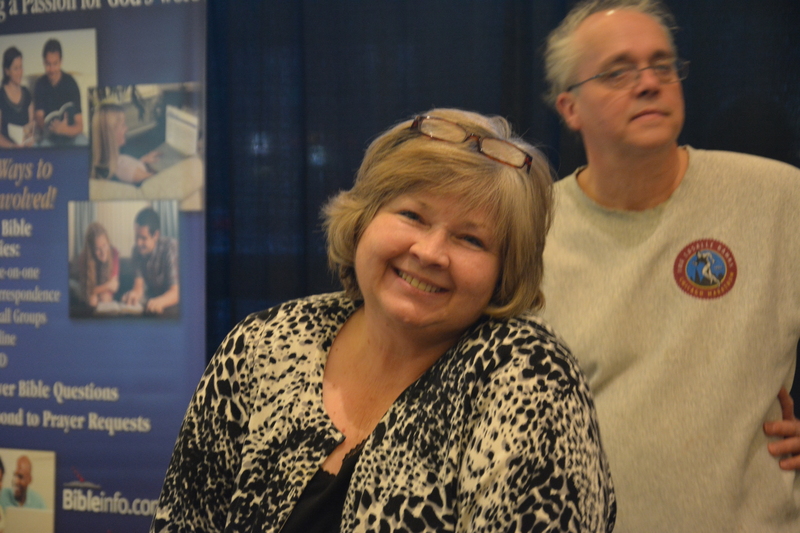 I had a nice conversation with a couple who stopped in when the presentation was ended after the home show. They seemed genuinely excited, so I invited them to come tomorrow. They led me to believe they’d come. I gave them the handouts from the first two meetings. We’ll see…. Overall, I am pleased with the performance of the volunteers, employees, and VOP staff. Still, we’re just doing our part. God is the One who will draw the people to Himself. It is not our might or power; it is by His Holy Spirit. Tonight, we seemed to have our smoothest running night so far. Most of the kinks in the systems have been worked out. The Russian projector is still intermittently on and then off, and we had one remote site which had to go to DVD tonight. But, most everything else went well. We praise God for what He is doing! We thank God for your cooperation with Him! I sat in the audience near several people who were using the earphones for foreign language interpretation. There was Spanish in front of me and Russian several seats to my left. I’m not sure what language was in use behind me. They seemed to appreciate the meetings. I sat next to some young adults who really seemed to be paying close attention to Shawn’s message. I am thrilled to see that people of many different backgrounds and experience are being ministered to in this process. Even though the subject hasn’t been brought up yet, I have already heard of people wanting to be baptized. I’m told that we already have ninety people enrolled in the Bible School. The VOP says that’s a great number for this early in the series. For the remote sites, please send us attendance updates for mutual encouragement. If you have encouraging stories to share, please send those in as well. Copy them to clyons@mnsda.com, mmauk@mnsda.com as well as to pr@vop.com too. 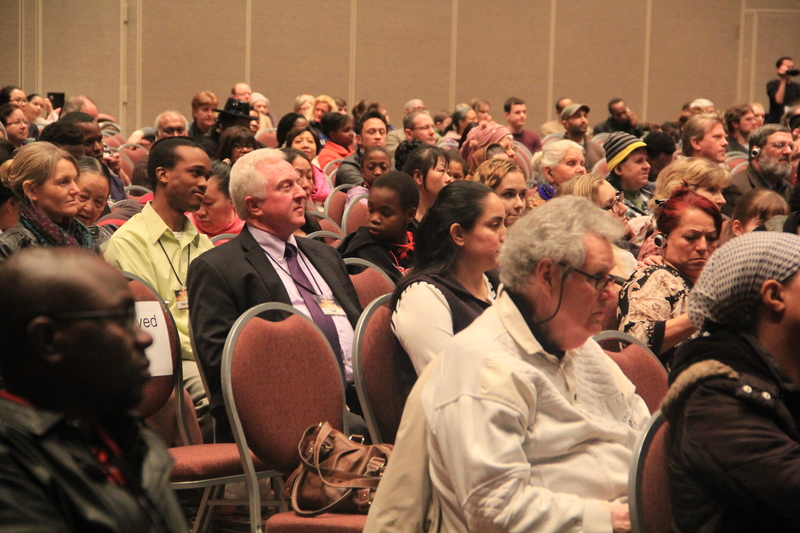 The Revelation Speaks Peace seminar, with speaker Shawn Boonstra, began on Friday evening, February 27, 2015 when Minnesota Conference President Justin Lyons welcomed an opening night attendance of approximately 1700 people to the Minneapolis Convention Center. 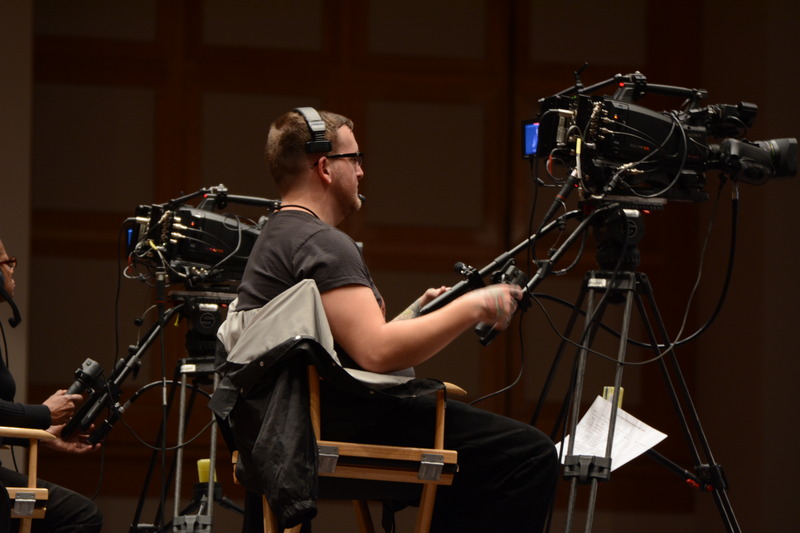 Remotely, audiences of various sizes received live streaming transmissions in Bemidji, Faribault, Park Rapids, Thief River Falls, Arlington, Buffalo, Detroit Lakes, Pipestone, and Windom. Onstage three large screens projected images, each with a different language for the text. The central screen was in English, with the side screens in Spanish and Russian, respectively. 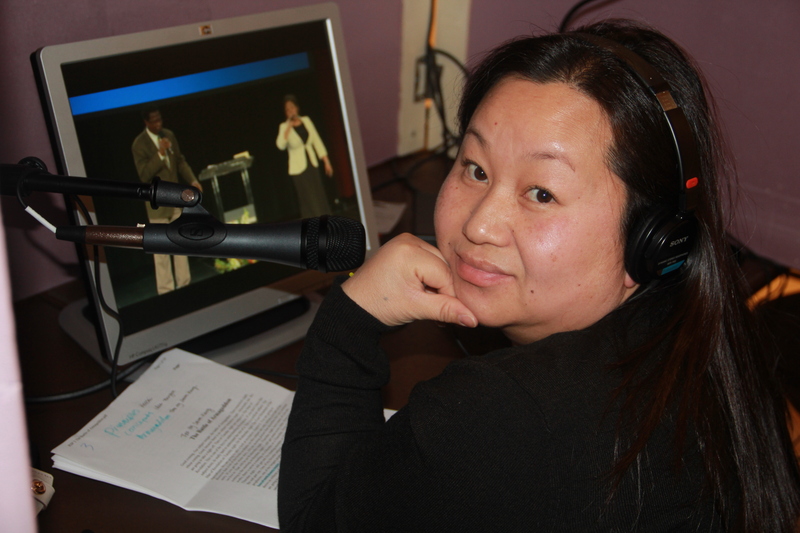 In a service hallway outside the main ballroom, sound booths were set up so than people in the audience could listen through headphones to the message simultaneously translated into Spanish, Russian, Hmong, Korean, Oromo, or Somali. 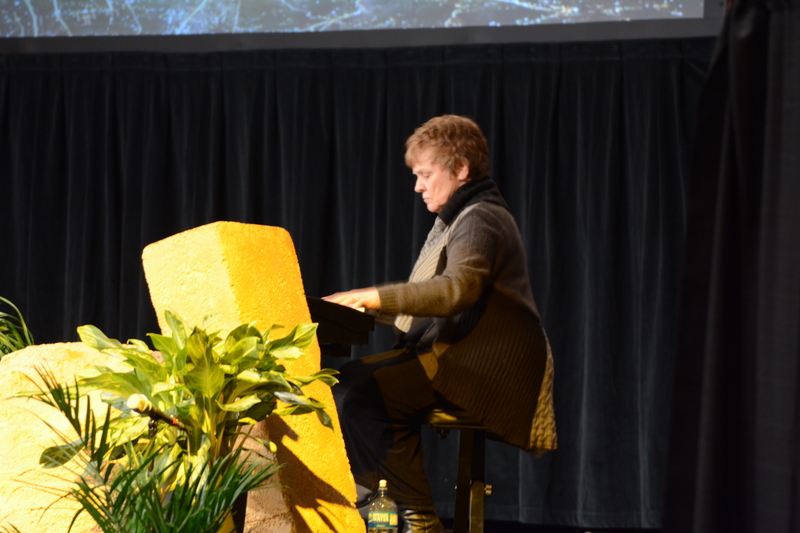 Through the first weekend, audiences were treated to the outstanding musical praise of Janet Blomberg on the keyboard, and to the thrilling vocal praises of Charles Haugabrooks and Christine Wollman. The Biblical messages presented by Shawn Boonstra were powerful. Already our volunteer staff have reported enthusiastic reactions from guests with whom they are getting acquainted. Many of the paid professionals from the community who are providing security, translations, or audio/visual expertise are paying close attention, and expressing their eagerness to hear the rest of the series. The early reports indicate that nearly 138 people have signed up for the Bible Schools which will be part of the follow up to the meetings. That number is expected to grow as the series continues. Sales of related materials, such as books, musical CD’s, and advance sales of the series on DVD, are moving along as well. Please continue to pray for the series as it progresses. The Metro area pastors are organizing to make contact with interested attendees, churches are preparing various programs to follow the meetings, and friendships need to be forged. Your support in all ways is appreciated, and God bless you for your faithfulness. He explained to me that, he has been to Bible School, he has worked with the Jesus film, he has been a leader in his community, but what he has learned in three days translating Boonstra messages is completely new to him. I listen to him talk and I was just amazed by the excitement in his voice. He was so surprised that the Bible contained so much historical details of human civilization. Can I ask you to pray for this brother and let’s ask God to enlighten him with the truth? I know from my reading that in his community, Christianity is seen as something which is deviate. So let’s also pray for his protection because I know his community does not take this kind of opinion lightly, there has been a movement which seeks to purify their cultural religion. This movement has violently rejected coexistence with other religions. During the “Revelation Speaks Peace” seminar, I stepped back into the side hallway; I could not believe what I was hearing! It all sounded confusing, but it was the most beautiful sound of the gospel, being delivered in different languages. 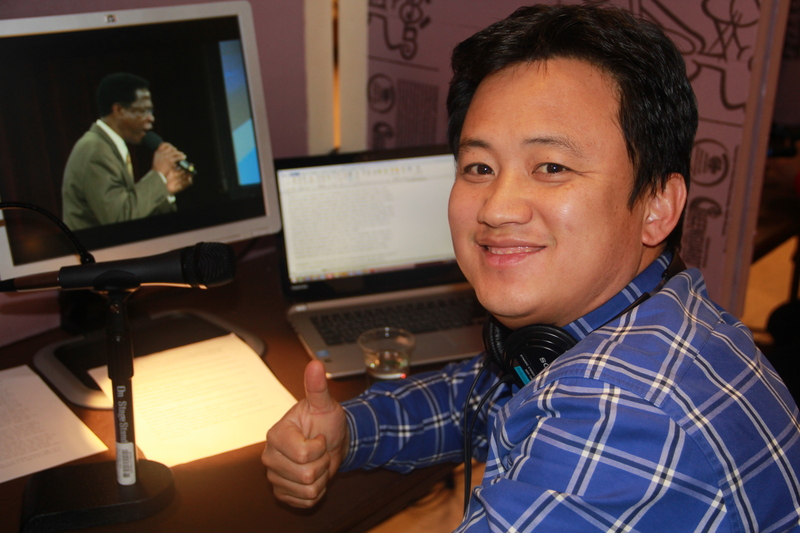 This was the Language Services Station providing the translation into different languages for those that were attending the evangelistic meetings. The Seventh day Adventist Church believes that it has been called by God to proclaim the everlasting gospel to those who dwell on the earth—to every nation, tribe, tongue, and people. The church is always looking for ways to proclaim the gospel to all people. At the “Revelation Speaks Peace” meetings, we have six translators, plus an American Sign Language translator. We want to thank the entire translation team. Because of them, we are able to proclaim the Everlasting Gospel in the following six languages: Spanish, Russian, Hmong, Korean, Oromo, and Somali. The Voice of Prophecy program, “Revelation Speaks Peace”, taking place in Minneapolis, Minnesota, is a great blessing to many people. 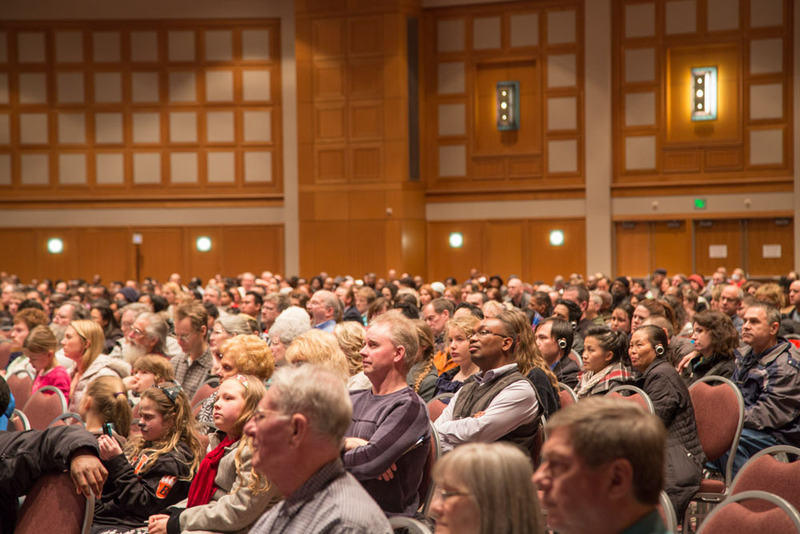 It is amazing to see people from all walks of life flocking to the auditorium at the Minneapolis Convention Center to hear what the Bible prophecy says about the future of our world. I was taken by surprise on the opening night, February 27, 2015, to see the auditorium packed. I was surprised by what my eyes witnessed. I went to the translation booths, where interpretation is provided in six languages. 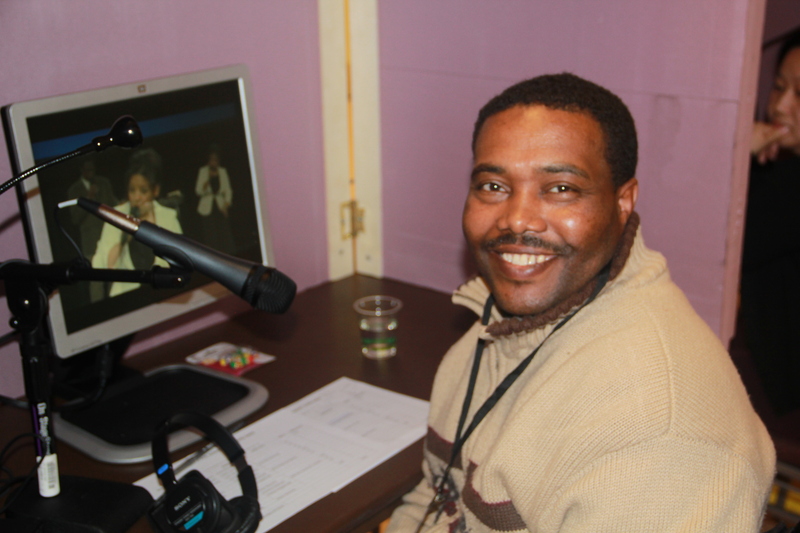 As I was getting ready to start interpreting the first night, a request came to connect Oromo language speakers in Portland – Oregon, Seattle – Washington, and other places to the Revelation Seminar via teleconference. 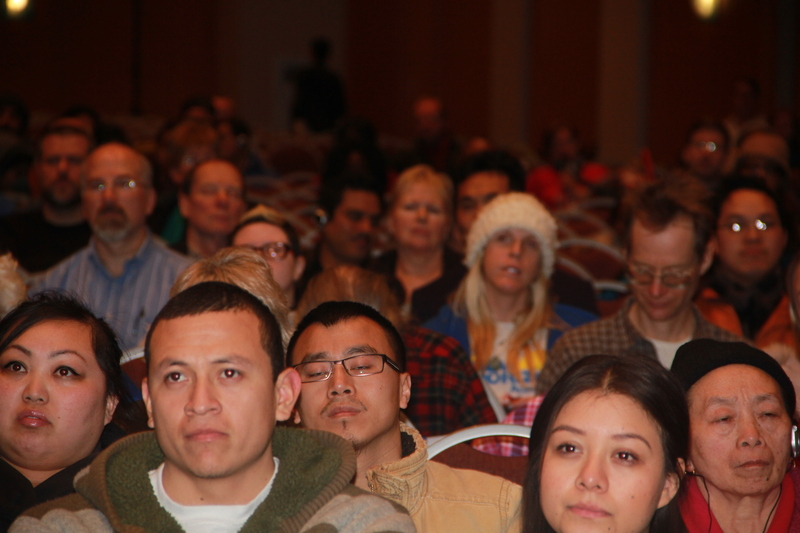 I thought I was going to interpret only to people in the auditorium at the Minneapolis Convention Center. Little did I know that people were packed in a teleconference room to listen to the message from Pastor Shawn Boonstra. It is amazing how technology has made the spreading of the everlasting gospel much easier now compared to a few years ago. We definitely will continue using the conference call-in number to connect Oromo speakers to the Minneapolis Convention Center so that they can continue taking part in the blessings from the “Revelation Speaks Peace” seminar. I learned that people are extremely hungry for the word of God, but in particular to learn the way the Seventh-day Adventists interpret the books of the prophecy. 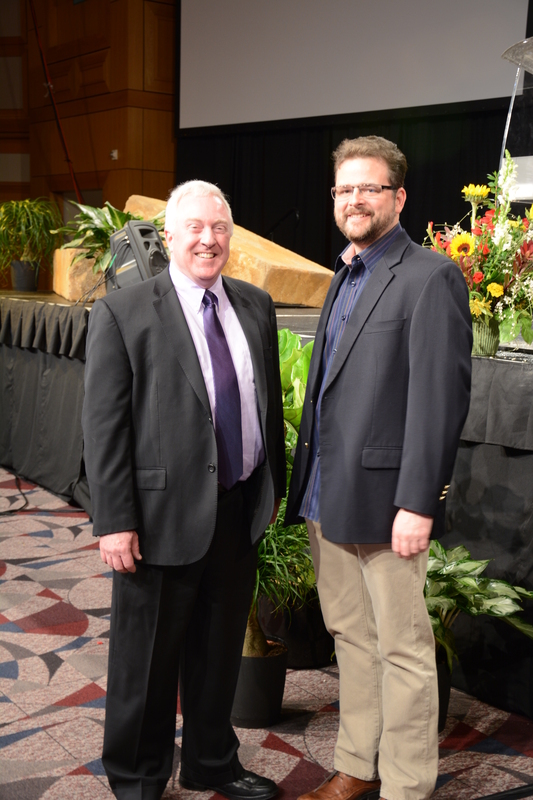 Through their network they have created a way to sneak into the convention center and get blessings from Pastor Shawn Boonstra’s presentations on prophecies of the Bible. Yes, Revelation speaks peace and those words of love and peace from the Loving God are being heard by many. The leadership of Minnesota Conference has done a wonderful job of coordinating the resources in the conference to facilitate the program. The decision made to interpret the program to different languages is remarkable. The excitement I see among the volunteers, pastors and VOP staff is great. The main and critical question for me as pastor of the Oromo SDA Church in Minnesota is how thousands of Oromo language speakers in the Twin Cities can be reached with the “Revelation Speaks Peace” seminars. We have passed the invitation to many. My prayer is that people will respond to the voice that bids them to take part in the blessings God has sent for them. Only God can do that, but we must stay focused and pray that the message being presented changes lives. 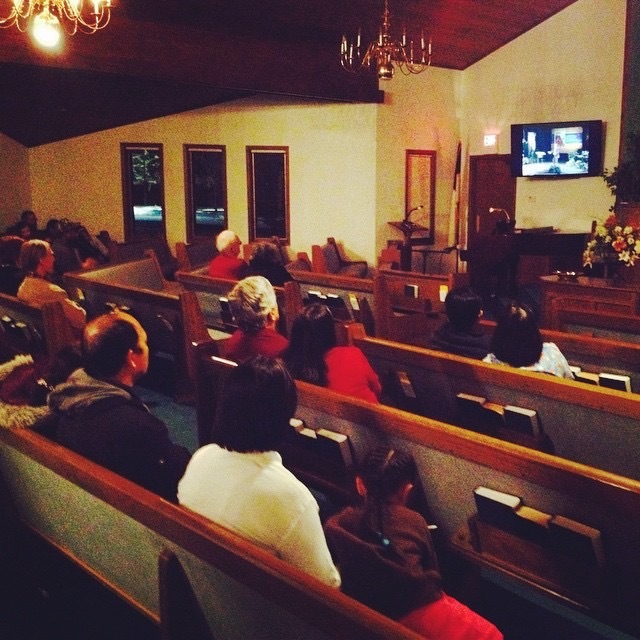 The first two nights of live streaming Revelation Speaks Peace 2015 were almost a disaster…at least in Pipestone, MN. In preparation for live streaming Shawn Boonstra’s “Revelation Speaks Peace” throughout the month of March, 2015, the Pipestone SDA Church finally decided to invest in some new A/V equipment. 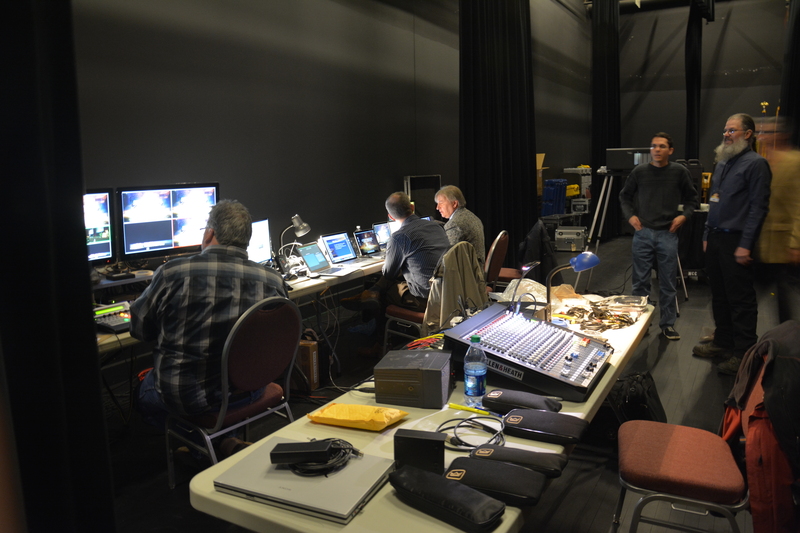 The two weeks prior to the start of the series everything was running and working relatively smoothly. It was clear to many in the church that God’s hand was leading and guiding as we frantically prepared for the start of this large evangelistic event. On opening night in Pipestone we had 33 people come out to watch the program. However, in my experience with anything related to evangelism, Satan is always looking for a way to sneak in and destroy what God has been preparing. Ten minutes before the program was supposed to start we lost one of our brand new monitors. It simply quit working! No matter what we tried to do it would not work. If that wasn’t bad enough, the live streaming that had worked just fine the night before began skipping and freezing. There was no way we were going to be able to enjoy or benefit from Shawn Boonstra’s message with a live stream that needed to buffer every 30 second. We had been fervently praying throughout the previous weeks that everything would work according to plan, but it seemed as though God had let us down. On night two, after a repeat of night one, I went home very discouraged and defeated. I poured my heart out to God asking Him why He had allowed for such a disaster. But true to form, God HAD made provision for our little church. Just one week before, the Voice of Prophecy had sent each one of the registered live streaming sites in Greater Minnesota a full DVD set of Shawn Boonstra preaching the same messages in Arizona! God is good! Those DVDs got us through the first two nights and by nights three and four, we were able to resolve all of our technical issues and began live streaming once more. I know that God has a great plan for our church and for the MN Conference through this series of meetings. Keep lifting up Jesus and He will draw all people unto himself.